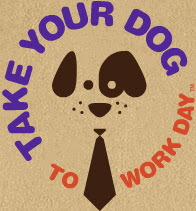 Take Your Dog to Work Day: It's almost here and you're probably wondering how you'll get Fido prepared. He needs 2 things: To look good and behave well. Ready my tips at this link. Then enter our giveaway, but you'll have to act fast. This giveaway will be gone in a flash, with entries ending Saturday, June 14 at midnight. How coincidental that Father's Day is the next day. Will your dog wear a tie to work? Bandanas are good for casual Fridays, so we're offering ours up for your dog if a tie option does not exist. Our giveaway also includes a set of 3 dog-training videos with a television trainer (No, she doesn't whisper). Don't waste any time. I'll need to collect addresses and ship these prizes Monday so that your dog will be looking and acting like the lady or gentleman that you want them to. Good luck! Hmm, we need a leave your dog home day. They go everywhere unless it's too hot in the vehicles. Then they stay at the office with a fenced yard. No uniform required here. I just put Molimo in hard labor line! She has to dig for her grub. We have a dirt hill/mountain that gets rearranged on a daily basis because the girls are bored at work. Everyday is a Take Your Dog to Work Day around here. Somedays Steel goes to work and I don't. Wilson just hangs out wherever I am. He usually lays down and patiently waits on me. Unless we are working in the greenhouse and then he patrols looking for invaders (lizards and rodents). He also usually manages to get everyone to pet him. We are really fortunate because Peter actually takes Dumpling to work on a usual basis (1-2 times per week). Peter's workplace is dog-friendly, so Dumpling has plenty of friends around the open office. The other days I am home with Dumpling while I study and do research. No special uniform necessary for him! Although for Halloween (yes, I realize this is several months away) I plan on getting Dumpling a pirate costume and having Peter dress up as a parrot (ha)! Schooner will be going to work with me...the sad part is school is out for the summer...he will not be able to play with the students. He will stay in my office with me. He will be wearing his AllThings Dog Blog bandana. Schooner and Skipper only they only wear their special for special occasions. Well, unfortunately I won't be taking Penny to work. I work at a corporately owned restaurant, and they don't allow dogs AT ALL. Luckily, my husband works from home, so EVERYDAY is take your dog to work day!